After sporadically playing it for three years now, I’ve finally completed New Super Mario Bros U! 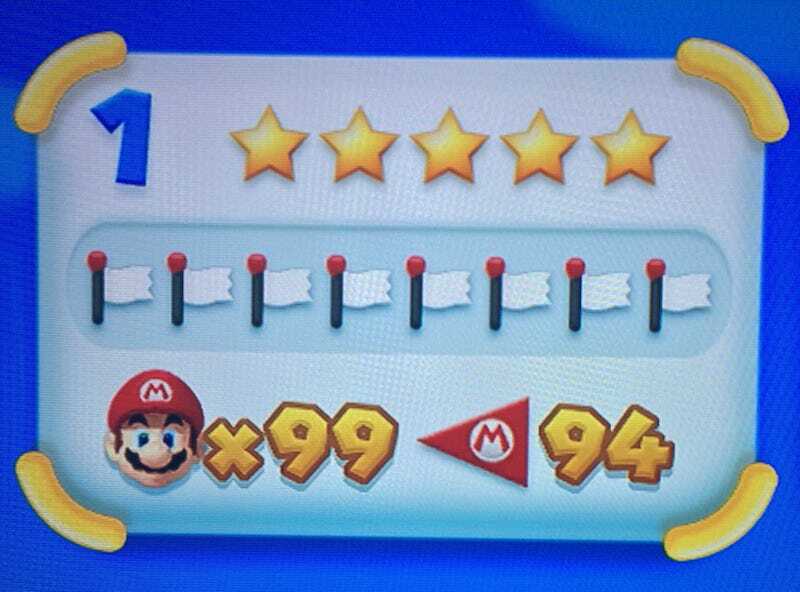 In NSMBU, your “completion” is tracked using stars on your save file, as in the image above. Five stars means you’ve finished every stage (that’s the 94 flags there), got every single star coin in the game, and caught the Nabbit at least once in every zone. Oh, and if you really want to complete it, you have to get 99 lives (which is easy because the last level in the game is a 1-up factory). So the funny thing is, there are very few games outside Mario games that I do this type of thing with. I’ve been a completionist about Super Mario World, Super Mario Galaxy, Super Mario 3D Land, New Super Mario Bros. 2, and now NSMBU. I’m close on Super Mario 3D World. If I go look up my Playstation profile on PSNProfiles, it says I have 247 total games (yikes) and just 9 “completed”. Of those that qualify as “completed”, only 5 have platinum trophies. So in general, I’m far from what you’d call a completionist! In fact, I’d say I’m really the opposite—I usually don’t care to do every last thing in a game before putting it down. Besides Mario games, there’s one other type of game I’m more likely to “complete”—open world action games. Sleeping Dogs, Shadow of Mordor, and Just Cause 2 are three of my five platinum trophy games on my Playstation account. Excluding multiplayer trophies, I “completed” Tomb Raider and Assassin’s Creed 4 (and Freedom Cry) as well. I don’t know what it is about these particular types of games that compels me to suddenly be a “completionist” about them, but there’s definitely something inside me that drives me to get that last star coin and see those letters turn gold on my save profile. Part of it is because being a completionist for these games is something that’s within reach—I know with X amount of time and effort, I can accomplish this, and that time and effort is acceptable to me. There are other games that I sometimes feel this bug with, but that I’ll never “complete” (the current one most like this is N++—I get that compulsion to “complete” it while playing it but I never will because there’s just so much in there). So, are any of you completionists about particular games? What was the last game you “completed” and how often would you say you feel compelled to “complete” a game? Is there a particular genre or series you’re far more likely to “complete” (like me with Mario)? What are your thoughts on “completionism” (besides questioning whether that’s a real word)?